Constant readers may remember my glowing review of an original feature from Korea, King of Pigs. The only way I was able to obtain a copy of that gem was by way of the Criterion-esque Plain Archive (although I have to wonder why these guys interlard stellar items like The Housemaid with mainstream trash like Terminator: Genisys). Now U.S. based distributor Olive Films has lined up a domestic edition of King of Pigs, along with director Yeon Sang-ho's other animated feature The Fake. This is excellent news. Original Korean productions are few and far between, and don't get much play when they do turn up. 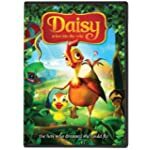 The last one of note I can recall before this was Leafie: A Hen Into The Wild (released domestically, and which I still have to talk about when time permits). I've been waiting for years for a real wave of original Korean productions to come storming out of that country the way its live-action cinema absolutely exploded into the public consciousness of the rest of the world at the end of the Nineties, but if we get a trickle rather than a flood, I'll take the trickle. Some major Vampire Hunter D news, as efforts gin up to reintroduce the franchise to a new generation. 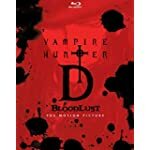 A Kickstarter is in the works to produce a new D comic, and a new TV series is also in the works — one financed by Western producers, although that's less and less unusual as time goes on, and the second D feature was co-produced by now-defunct U.S. anime distributor Urban Vision. Ten to one the show debuts on Netflix this side of the ocean. He even has the teeth to match! Willem Dafoe will be voicing Ryuk in the live-action Death Note production slated to hit Netflix next year. My prejudice is showing; I have been a longtime fan of Dafoe's work (The Last Temptation Of Christ, Light Sleeper, Streets Of Fire, Antichrist, The Hunter, To Live And Die In L.A., Tom And Viv, and on and on), so this is another net plus to a project I've been dubious about. Keep it up, guys, you're winning me over. Next up for the "leap to live-action" list: Sword Art Online, now to become a live-action TV series. I'm not a huge fan of the source material, but I'm curious to see how they plan to adapt the material — for instance, if they plan to tart up the "inside-the-game" sequences with CGI. Which, if you think about it, would make it much closer to a new kind of animated series than a live-action one. 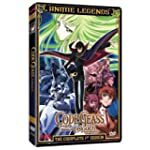 Another former Bandai title promised to us a ways back by Funimation has finally hit the slates: Code Geass: Lelouch of Rebellion, both season one and two. This is one of those make-or-break titles for some folks, ambitious and and yet ever so flawed in some vital ways (especially in its second half), but worth discussing. Previously promised, but still MIA: Outlaw Star. My understanding is they're waiting on materials to be available before they can proceed. Before I left the New York area, I sprung for a used copy of the original Bandai DVD issue. No regrets. It's staggering how far CGI has come in terms of photorealistic depictions of the human form, but with this clip I keep feeling the anime-esque exaggerations in the faces and eyes simply doesn't work here. Go full-on photorealism and forget about trying to nod too closely to the original art; it'll stand up better over time. Researchers think we may have to protect our brains from hackers before long.